What are Remnant Beliefs about Temples? Joseph Smith built temples in Kirtland and Nauvoo. The LDS Church has more than 100 temples in operation now, worldwide. In our last conversation with Jim Vun Cannon, a counselor in the First Presidency of the Remnant Church of Jesus Christ of Latter Day Saints, I asked if temples are a part of their worship. Jim: Yes absolutely. In fact we have a recent revelation that talks about beginning to prepare for the building of the temple, but we haven’t had a command to build a temple yet, but to prepare for that. We do believe in temples, absolutely. GT: I know the RLDS Church/Community of Christ, I actually remember going to the temple, I was so excited. In the LDS Church, you can go to the open house but after that it’s hands off, and I was really excited to go to the Independence Temple. Even in Kirtland, that’s a temple that’s open to the public. Would you anticipate that would be the case as well? That it would be kind of a special meetinghouse? Jim: As best as I can say, I would think it would be very similar to how we treat Kirtland: reverently but it’s still open. There’ s nothing anything in there that someone couldn’t see. GT: Ok. I know baptisms for the dead. I believe that’s something that was canonized in the RLDS Church for a time, although then it was later moved to an appendix and actually has been de-canonized. Jim: Yeah, section 107 is what it is for us. In the 1970 conference they put that in the appendix, yes. GT: Oh, ok. Joseph I believe said that baptisms for the dead should be done in the temple. I know that before the Nauvoo Temple was completed, they did some in the Mississippi River. Is that something that you guys would participate in the Remnant Church? Jim: No. Here’s where we’re at with that revelation. We don’t deny that Joseph gave what we call section 107 which was talking about finishing the temple, otherwise you’ll be rejected with your dead. I’m not sure what section it is for you all. GT: I don’t know off the top of my head either. Jim: Oh you don’t either. The way we look at that is that we see that there was only two places that it was given instruction that it could be done. One was in the temple in Nauvoo, and the other was in Independence. The other part of that was, the other issue that we have with it is that we don’t have any instruction through Joseph from the Lord through Joseph on that particular instance—for instance like I was talking about your section 20 which is our section 17, the Lord was very specific in explaining how water baptism was to occur and what was to be said and so forth. We don’t have anything like that and so we find that kind of spurious that there wasn’t any instruction given that we can point the reference to and so forth that that was to occur. We also talked about a lay clergy, differences with high councils, and I discovered they don’t have stakes yet! I hope you enjoyed our discussions, and I hope you’ll check out parts 1–8 as well! Check out our conversation…..
We’re continuing our discussion with Jim Vun Cannon, a counselor in the First Presidency of the Remnant Church of Jesus Christ of Latter-day Saints. It’s been a long-standing tradition in the RLDS Church that Joseph Smith was a monogamist. 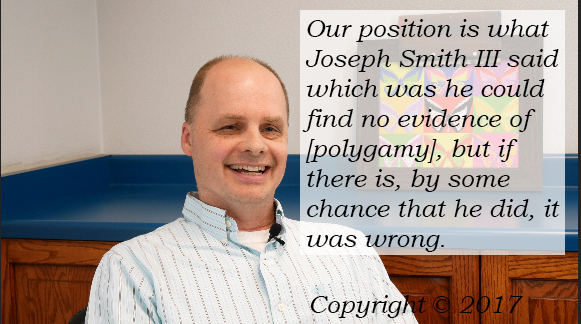 However current prophet/president Stephen Veazey announced that the RLDS Church, also known as the Community of Christ no believes Joseph Smith did not engage in polygamy. What does the Remnant Church do? Do they hearken back to the old RLDS positions, or do they agree that Joseph Smith was a polygamist? Jim: No I don’t believe he did. Here’s what I would say to that. Our position is what Joseph Smith III said which was he could find no evidence of it, but if there is, by some chance that he did, it was wrong. That’s the position of our church. The Community of Christ rejects a lot of those Nauvoo-era revelations, which 132 would have been. How do you handle that? You just don’t believe in any Nauvoo [revelations?] Was Joseph a fallen prophet by then? Jim: No we don’t believe he was a fallen prophet. We don’t believe he was at all. I know there were people in the Reorganized Church and perhaps some in the Community of Christ. I can’t tell, but I do know there was a belief that Joseph was a fallen prophet at some point because of some of the things that happened in Nauvoo. The way we look at Nauvoo is different than I believe the way the old Reorganized Church looked at it. They just kind of threw [it out.] Nauvoo was there. We don’t really want to talk about it. We don’t want to talk about what happened because there were a lot of bad things that happened there. The way we look at it was there was some good things, wonderful things that happened there, and there were some not so good things that happened there. We tried to sift through those to see what’s there because to your point, there were just some revelations that didn’t [hold up]—and some of them, here also, we may not look at it as revelation. We may question the authorship of and so forth and so on. I don’t want to get into conspiracy theories or anything like that. That’s not the rabbit trail I’m trying to go down. It’s just we can’t tell. For instance there was some things given in Far West, the Wentworth Letter. GT: Where the Articles of Faith are. GT: The Articles of Faith are part of the Wentworth Letter. That’s actually part of our Pearl of Great Price. Jim: Right. 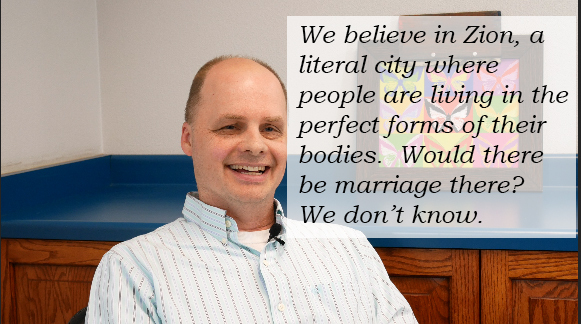 That’s in there, but that’s not part of our Doctrine & Covenants. As to why some of those things became, I hate to use the word ‘canonized’ because of where we are, why they weren’t included in the open canon, I don’t really know. I can’t speak to that. I’ve tried to go back and research through our line why the RLDS Church made some decisions they did and didn’t. I think some of them were just, they just didn’t at that time know, and they just set it on the shelf and just left it there. I also asked about some contemporary evidences, such as the Nauvoo Expositor, and whether they like to be called RLDS or Mormons. Check out our conversation! You might want to check out my episodes from Brian Hales where Brian talked about his evidences against Joseph’s monogamy, and don’t forget to check our our other episodes from Jim! We’re continuing our discussion with Jim Vun Cannon, a counselor in the First Presidency of the Remnant Church of Jesus Christ of Latter Day Saints. In this conversation, we’ll going to compare differences and similarities between the Law of Tithing and the Law of Consecration between the LDS Church and the Remnant Church. We’ve made a few passing references to the “Order of Enoch.” What is that exactly? Jim: That was something that was set about in the church. That was, oh goodness, I’d say the 1850s I believe was probably the first time that was there. Basically it was the idea of consecrating. GT: Are you consecrating all of your things together and giving them to the bishop and letting him disburse them? Jim: So that’s an interesting part about that. Having seen some of these, what I would call them, “all things common”, kind of little groups that are out there, it’s not like that. We interpret “all things common” a little differently, and we interpret consecration differently in the respect that it’s not a common purse. Certainly we’re to go before the bishop and we’re to get counsel from him on how to spend our monies, but we are still the steward over those monies. Even when we live in community together, we don’t have that community purse. Everybody has their own paycheck, has their own monies. It’s out of their own volition to do so that hey, so-and-so needs this or whatever. They consecrate that surplus to the bishop and the bishop then of course at a greater level look at who needs what and then provide that to them. It was a fun conversation as we talked about the differences in tithing and consecration between the LDS and Remnant Churches. 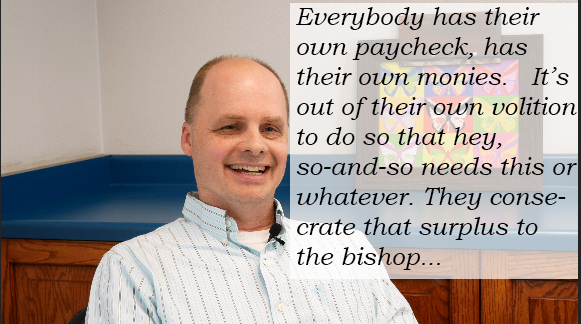 Both churches have had to adapt since the days of a “common purse” in Joseph Smith’s day. Check out our conversation!